The Southern Belles was a sell-out at the Adelaide Cabaret Festival in June. Co-Artistic Director of the Festival, Ali McGregor, had appeared in an earlier version of the show programmed for Morning Melodies at the Victorian Arts Centre in 2011. She thought the show could be re-worked as a cabaret production with the addition of a narrative, and it was performed there to great acclaim by Jane Clifton, Nichaud Fitzgibbon and Carla Lippis. Clare Moore (drums) and Rosie Westbrook (bass) shared Musical Direction of the show for the Adelaide season as they do for the MEMO Music Hall performance – appearing with a seven-piece band including a high-powered brass section. Nichaud Fitzgibbon and Jane Clifton, who were both in the original Victorian Arts Centre season, are joined by Rebecca Barnard for the MEMO Music Hall performance on 30 October. 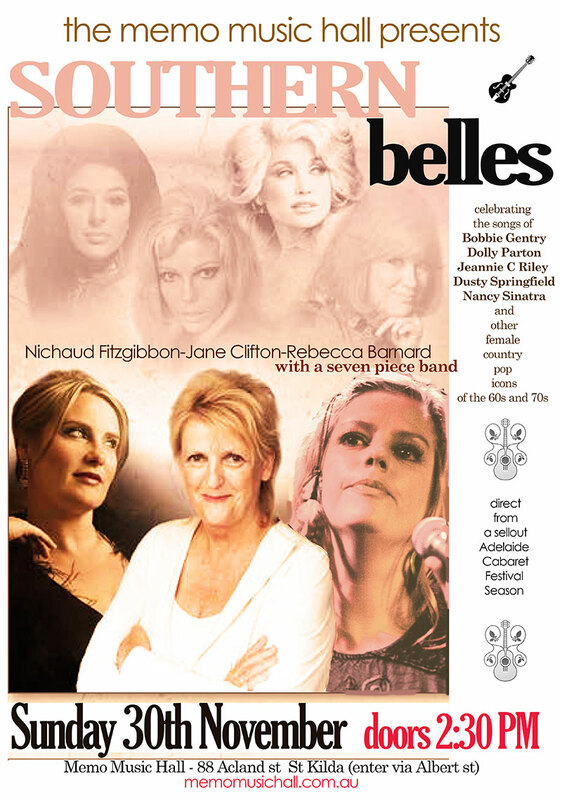 Celebrating the sassy, red–blooded female musicians of the late 60s and early 70s, Nichaud Fitzgibbon, Jane Clifton and Rebecca Barnard will perform the songs o fDusty Springfield, Loretta Lynne, Nancy Sinatra, Dolly Parton, Bobbie Gentry, Jeannie C Riley, Tanya Tucker and Linda Ronstadt. Also featuring the dynamic duo of Clare Moore on drums and Rosie Westbrook on bass as part of a seven-piece band including a high-powered brass section. Southern Belles is about a time in our history when the message had started to resonate that women could take a hold of their lives and their stories were being told through some amazing music.